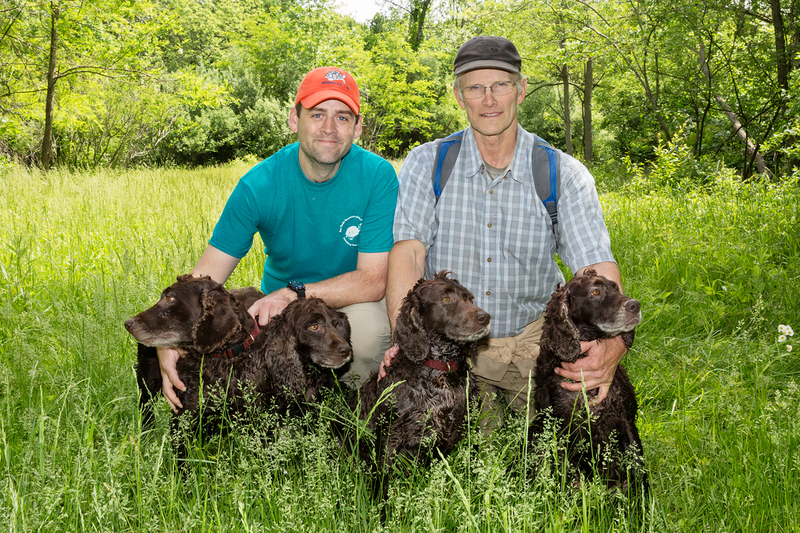 Rucker’s Boykin spaniels, which can sniff out box turtles. The dogs, half a dozen Boykin spaniels, whine with excitement. The dogs’ owner, John Rucker, discovered their special talent for turtle hunting when one of them brought him a box turtle it had found in the woods. He praised the dog, and that was the beginning of a new vocation. Turtle scientists, like today’s expedition leader, Matt Allender, learned of Rucker’s “turtle dogs” and started to call to ask for help locating their subjects. The team crosses a park road with the dogs on leashes and heads straight up a steep hill. At the top, the dogs go off leash in the muddy woods, and the real work begins. The dogs lead the search and the humans follow. Allender and the students are learning how to assess turtle health. They also are looking for ways to halt the spread of diseases like ranavirus, which killed nearly two dozen turtles from two parks surveyed last year. to ranavirus – might transfer the virus from turtle to turtle. “It’s unlikely, but we’re checking,” she says. She swabbed the dogs’ mouths before the hunt, and does so again after every turtle is found. Back in the laboratory, she and her colleagues will check the swabs for ranavirus DNA. reading so that the turtle can be brought back to this exact site after a full health check is done. The effort has spawned many student research projects. Third-year veterinary student Claire Butkus, 25, from Glen Ellyn, Illinois, is learning how to extract DNA from the shells of dead turtles to determine whether they were infected with a ranavirus or other pathogen. Other students explore whether proteins in the turtles’ blood can be used as markers of health or disease. Others help analyze the animals’ exposure to metals like zinc and lead. begin her veterinary training this fall.